You may not always be in your favorite place, but now it can always be with you. Thanks to artists Kasia Wisniewski and Nicholas Foley, you can have a one-of-a-kind memento honoring a childhood home, the exact spot where your sweetheart proposed, a dream vacation, or wherever your heart wanders. Simply provide any address, and a map of that place will be drawn and laser cut into acid-free, fade-resistant paper. The delicate lattice of streets is highlighted by the depth of their shadow box frames. The frames are available with either Art Nouveau or Floral flourishes of laser-cut wood, and you can choose from four paper color combinations (Ecru, White, Pale Gray, and Pale Gray with Navy). Made in Brooklyn, New York. Kasia Wisniewski and Nicholas Foley met at Pratt Institute, where they studied fashion design and industrial design respectively. After college, Kasia worked in luxury fashion for designers, while Nick became entrenched in the world of product design and tech start-ups. Collected Edition is where their skills meet. In their Brooklyn studio, they fuse modern fabrication techniques with traditional handcraft, creating heirloom pieces for a fast-moving world. With the help of their laser cutter, Kasia and Nick create intricate, one-of-a-kind cartography, jewelry, and home goods. They are inspired by the historical, the anachronistic, and the natural world. Wedding Phrase: (Name) and (Name) joined their hands and said they would. Engagement Phrase: (Name) asked, (Name) said yes. Baby: enter baby's name, birth date and special location. Care: clean with a cotton cloth. Overall, love the product, and my wife loved it too (more important). I was hoping the product would be just a bit larger and I thought the print would be a bit more vivid based on the pictures. Overall, no complaints with the product. Would recommend to anyone else celebrating an anniversary or special occasion. This was a great idea and would have made an unusual engagement gift, but the quality wasn't quite what I hoped for for the price. The frame is very light and the backing wasn't on securely. My design had quality issues (paper lint on the bottom contrasting paper and rough cuts in some areas that looked torn, rather than having a clean sharp edge). This was a fantastic present to honor a close friend's marriage. The design was simple, clean and modern and fit their tastes very well. This was a gift to our dear friends when they bought their first home. It is beautiful and personal, and they absolutely love it. It can be a keepsake gift to commemorate important events such as first home, wedding/engagement, birth of a baby, etc., but it's classy and abstract enough that it doesn't look like you just framed a map. I bought this as an engagement gift and this piece was exactly what I imagined, but a bit smaller than expected. It was a little pricey for me, but I took a risk and really liked how it came out. It was packaged well and I received it in good condition. This is a great gift. I really appreciate how each map is personalized based on whichever location you choose for either wedding date, engagement date, or birth date. The only thing I was surprised at is how light (in terms of weight) it is. However, that doesn't seem to have any impact on its overall quality. Very pleased with this purchase! I was also very happy with the color contrast I picked- it looks exactly like it appears online. it was a beautiful gift! i bought it for my sister as a wedding present and she and her husband loved it!! The gift was well received and isn't that what it's all about ... giving something that someone will like. Beautifully done, the map look just like the pictures. It was smaller than I imagined, but that's a good thing. Very light weight, and the frame is pretty but cheap material. 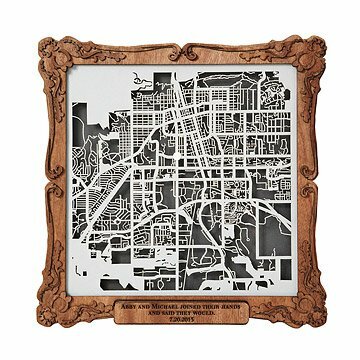 Commemorate the addresses of your loved ones' favorite places with custom, laser-cut street maps.